Picture yourself the morning after a fantastic first date. You are glancing at your reflection in the bathroom mirror, and one thought preoccupies your mind: what to text her? Just like certain face to face situations, starting a text conversation with a girl is not always easy. Fortunately there are a few simple tricks that you can start doing to make your job a lot easier. Read on to learn about 4 texting tips that you can put in use today to grab her attention and turn a phone number into something more. You know you have reached the romance Holy Grail when you learn how to start a text conversation with a girl. Outside of telepathically communicating our romantic thoughts, texting represents the last unconquered romantic horizon. 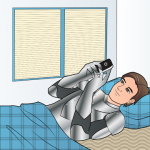 Cell phones have become the norm for seducing your dream girl. Use them to your advantage! – Create a sense of intimacy by sending flirty texts to your crush from across the room at a noisy party. – Keep the flame of desire alive, even when she’s on a business trip thousands of miles away. – Entertain yourself. Break up a mundane business seminar by texting a beautiful girl that you exchanged numbers with during the lunch break. If you are over the age of twenty-five, you most likely started your romantic communication journey in grade school, when you passed notes back and forth to the flame of the day. In high school, you spent the majority of your time not studying, but talking on the phone with your prom dates. Though college should have provided you with the opportunity to hone your romantic communication skills, you regressed by professing your love across crowded bars, typically after last call. You rebounded after college, though. Your romantic communications involved cell phones and personal computers. Just when you finally got the hang of talking on the phone and interacting online, texting became the next big thing. Suddenly, you’re back to feeling clueless. What To Text? That’s Easy! You might not realize it, but you have dozens of opportunities to text a girl. If you want to figure out how to start a text conversation with a girl, follow these simple, proven tips. As our writing teachers so rightly preached, you have little time to grab someone’s attention. The same principle applies to texting. 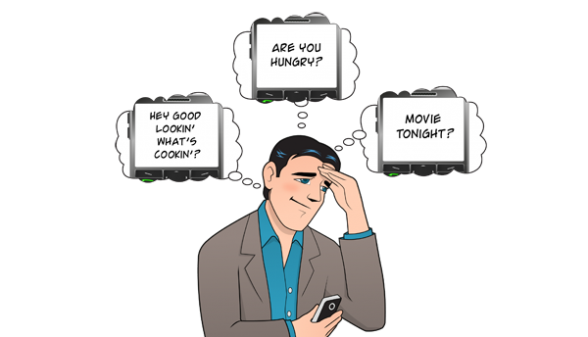 You should avoid the common mistake made by millions of guys who text the boring, “How are you today?” (wow, that should make a girl feel special). Now that you are psyched up to start texting a very special lady, get ready to learn some important tips. “Cute, smart and you love spicy food. You’re perfection”. Show her the real you. Make her want to know more. But always remember to make her the star of the show. Rambling on and on about yourself, without asking anything about her, is also a definite no-no. Save that for your grandmother. She’ll always love you, no matter how boring you are. Texting is not about describing your entire day. You should do that in person. Likewise, don’t send her a text asking her to hash out her entire day to you. In the beginning of a relationship, texts are akin to the appetizer before a meal, the trailer before a movie. They plant the seed of desire. They set the tone and craving for future interaction. They put you in her mind. Keep it brief at first. If you really want to write something longer, then break it up into multiple messages. Create suspense…have her asking you to finish your story. While texting appears impersonal, the reality is that you are instantly inside her personal space and have her undivided attention. Make sure that you take advantage of this great opportunity. Texting has taken face-to-face interaction out of the communication equation in many situations. It is the most common form of modern day flirting. Many of us shy away from looking the girl of our dreams in the eyes. The fear of rejection dominates our thought processes. Texting, like posting online messages, puts an invisible façade between the objects of our affection and us. We become more confident, but confidence does not mean we are optimizing the power of texting. Follow a few simple steps and you will be well on your way to learning how to start an enticing text conversation with a girl and, more importantly, keeping her full attention and desire focused on you through mesmerizing and well executed messages.  If you are excited about unleashing the unbelievable power of texting in your romantic life, then check out TEXT WEAPON. It will give you an almost unfair advantage in the highly competitive dating scene. Don’t miss another opportunity with your dream partner. Check out TEXT WEAPON – French Seduction Made Easy and enjoy all the passion and romance of a Parisian. How can I texting for a girl that I have just meet for 5 minutes? An easy way to turn a conversation romantic is to make a specific compliment – for example ” couldn’t help but notice that you were looking pretty good today in (clothing) ;)” It’s not too forward, yet flirty.